The metals copper and silver act as antibacterial and antiviral agents as well as fungicides. Due to the large surface area of the wool, composed of many thin copper strands, and the long dwell time, the bacteria stick and are killed off. This is due to the fact that ions of certain metals have a damaging effect on several pathogens, including bacteria, viruses, and fungi. An immense advantage is that these metals are not based on chemical biocides and, therefore, are physiologically completely harmless. Copper and silver only attack micro-organisms and are, of course, not dangerous to human beings. The effectiveness of copper and silver has been proven in several studies and confirmed by the American Environmental Protection Agency (EPA). In the United States, there are well over 100 nuclear reactors. A serious incident can happen at any time. 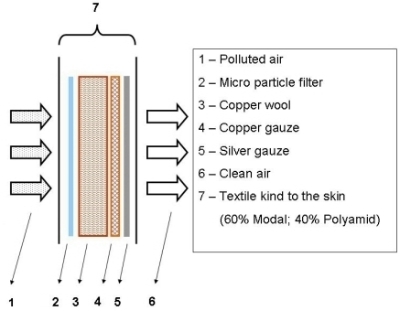 The Ding-Filter separates the polluted particles from the air. At the same time, the dose of radiation is reduced through a special, precisely matched inlay of copper wool and copper mesh. 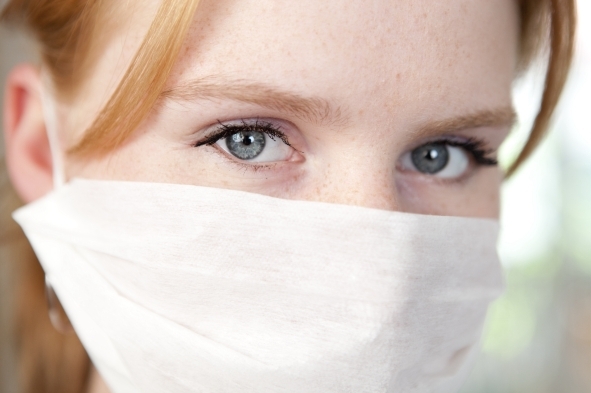 Therefore, you breathe cleaned air and the radiation contamination is drastically reduced. The generous dimensions of the mask cover the face at the same time. The mouth guard is intended for use outside of the exclusion zones! It is effective against alpha-, beta-, and gamma radiation, from particles, which accumulate in the filter. Alpha and beta rays are mostly shielded. The best shielding against gamma rays (attenuation factor 2-10) is achieved at energy levels of 10-100 keV. Naturally, the filter is not suitable for high energy levels directly in the exclusion zones or in immediate proximity of the radiation source. Caution: Does not protect against similar noxious and toxic air pollution such as paint fumes and mist, aerosols, fumes, gases and such! Warnings: Before using this mouth guard, please ensure that the mask conforms to the requirements of the application area. In case of shortness of breath, dizziness, or exhaustion remove immediately. The mouth guard is not considered personal protective equipment. Do not use while sleeping. Intended for single use.